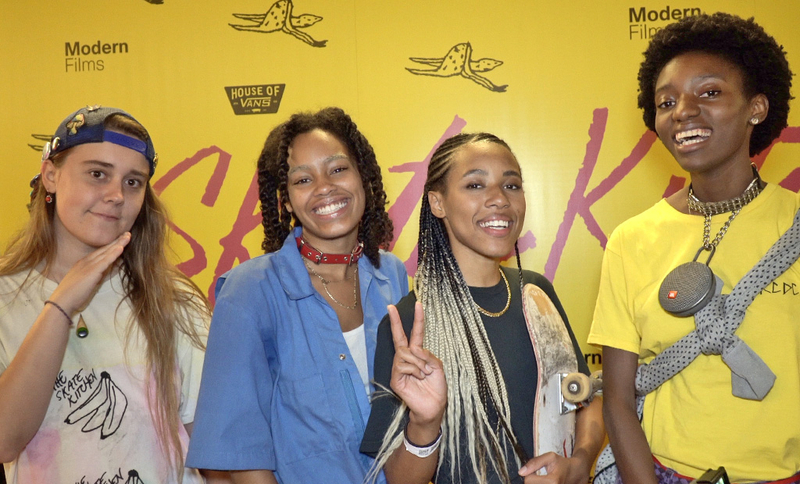 Skate Kitchen is the brilliant new movie that follows a real-life sisterhood of young female skaters in New York led by Rachelle Vinberg. The film charts their growing friendship as they struggle through the trials of growing up, as well as striving to perfect some badass skating skills. From the aesthetic to the banter to the actual skating, the feature has the ruggedness and authenticity of a documentary, skilfully straddling fiction and reality. Putting this element of the underground New York scene on screen also challenges traditional ideas of femininity and who can do which sports. The “slice-of-life”, coming-of-age tale is one of discovery and diversity, about overcoming taboos and navigating womanhood. We had the pleasure of chatting with director Crystal Moselle (The Wolfpack) at the film’s UK launch at the uber-cool House of Vans in the Waterloo station underground vaults, about how she first came across the skaters, the challenges and fun of working with the non-actors, and what she hopes the impact of the film will be. The skate crew were also there to tell us about the joys of making Skate Kitchen, why they love London and what they hope people will take away from the movie. Skate Kitchen is released in select cinemas on 28th September 2018.